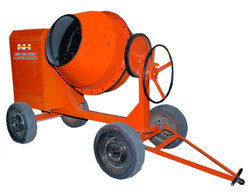 Our product range includes a wide range of cement mixer machine. It is a machine that homogeneously combines cement and other building material as sand, gravel, water to form concrete. A concrete mixer uses a revolving drum to mix up the components. They are used at as machine to prepare the raw materials for construction purposes. Looking for Cement Mixer Machine ?